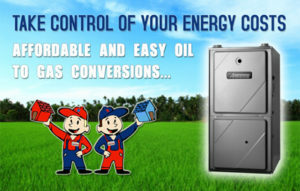 Are you tired of the high cost of an oil furnace? In Ottawa and the Valley, the price of running an oil furnace has increased drastically in the past few years. ng to a propane furnace homeowners can experience significant savings on their utility bills! nual maintenance and a large number of other benefits including diagnostics! We want to help you save! At AirZone, we offer a full line of services to help reduce your energy consumption. We have even partnered with excellent companies such as Superior Propane to help you get the best prices on your propane gas. We also offer excellent financing packages to help spread the payments over a number of years. This way you will enjoy the reduction in energy costs without a large up front payment. Your average utility bill will be lower when you heat your home. Many homeowner’s insurance plans include a surcharge for oil. Make sure to contact your insurance company and inquire about any discounts available when the switch to propane is made. Propane is a much more environmentally friendly product due to its cleaner burning characteristics. You can power additional appliances, fireplaces, BBQs, and more! What are my Propane Conversion Options? Install a Heat Pump – By installing a propane heat pump, our clients will experience a reduction in energy consumption along with the added benefit of being able to heat their home in the winter and cool it in the summer.